Graduation season is upon us. Across the nation, countless hungover students are sitting through long and drawn-out speeches that stress the importance of working hard, integrity... blah blah blah. And dotted throughout the sea of monochromatic graduation caps and gowns, bright spots of color catch the light like stars in a velvet sky—personalized graduation caps that tell America no, dammit, you will not break my soul and force me into conforming to your soulless and corporate ways. 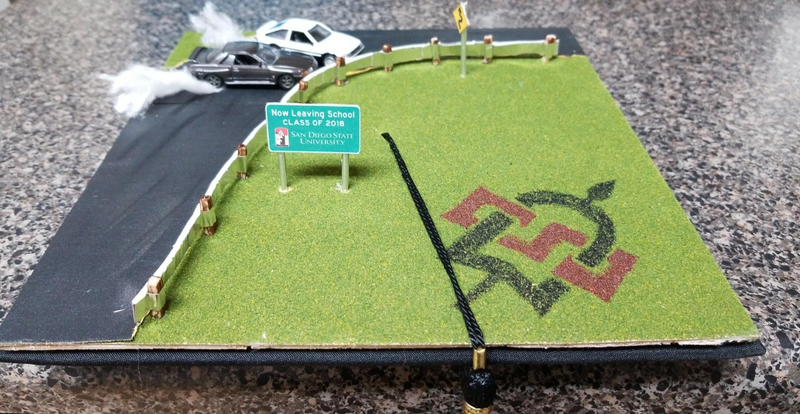 I’ve seen some pretty creatively decorated graduation caps, but this one that reader Mitchell Burton tweeted at me was the best. He said it’s inspired by a drifting scene from The Fast and the Furious: Tokyo Drift, the third movie of the Fast and Furious franchise and arguably the best, though he actually used Initial D toys for it. The terrain is a ReadyGrass from the model train section of the hobby store overlaid with black sandpaper to simulate the mountain road. The guard rail is aluminum tape with a flexible foam core supported by stained balsa wood posts. More aluminum tape was used for the sign poles with the actual signs cut from a sheet of ABS plastic. Markers and paint were used for the logo on the grass and colored pencils for the tire marks on the road. Some cotton make-up wipes create the tire smoke from the drifting 1:64 scale Skyline GTR and Corolla Levin (these are actually licensed Initial D toys). The whole diorama sits atop a lightweight balsa wood base that Velcros to the cap so it can be removed, not that I plan on removing it. That is some true dedication and I wanted to share Burton’s handiwork with all of you. How are other people supposed to know you’re a gearhead unless you advertise it on every flat surface on your person?